Now that we’re moving into the cooler months I love making soup for dinner. I could eat it most every night. And lucky for me, my family enjoys soup just as much as I do. 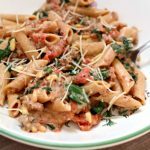 My husband loves to take the leftovers for lunch the next day and most of the time soup leftovers are better than the first night since the flavors have had more time to marinate. I created this soup using Hurst’s Hambeens 15 Bean Soup. You can find these dried bean soups next to the dried beans in your local grocery store. They are a very inexpensive way to serve a LOT of people. This package of beans is sold for about $2.28 at my store…add in a few other ingredients and you have enough dinner for 15 people! Talk about stretching a budget. I also like that the beans are so full of nutrition! Lots of protein and fiber. I decided to go the smoky route with this bean soup. I added in smoked sausage, liquid smoke and smoked paprika. Because the beans take a very long to cook and get soft I decided to add the sausage into the soup during the last hour so it wouldn’t get all mushy. In addition I added the high acidity items at the end as well because they prevent the beans from getting soft. I served my soup with a square of cornbread and it was a delicious and hearty meal. This soup is a perfect recipe for those who work long hours. The beans take a long time to cook so get the recipe started early! 1. Open package of beans and remove the seasoning packet. Save for later use. Pour beans into a large bowl and cover completely with water. Let soak overnight. 2. In a morning, drain off all the water and place beans in the slow cooker. Add in 8 cups of fresh water. Add in onion, liquid smoke, Worcestershire sauce, garlic, smoked paprika and chili powder. 3. Cover and cook on LOW for about 12-14 hours or on HIGH for about 8 hours, or until beans are soft and tender. 4. Add in the HamBeen seasoning packet, sausage, tomato paste, tomatoes, lemon juice and salt and pepper. Cover and cook on HIGH for another 30-60 minutes to let the flavors blend and the sausage heat through (these items are added later because the sodium and high acidity prevent the beans from getting soft). 5. Salt and pepper to taste and add in additional seasonings, if needed. Ladle into bowls and serve with warm rolls or bread. Hurst’s HamBeens is also giving away a $50.00 gift card to your favorite grocery store and a 2 pack of the new Slow Cooker items offered by Hurst’s Hambeens! Enter below! U.S. Residents only, please. P.S. 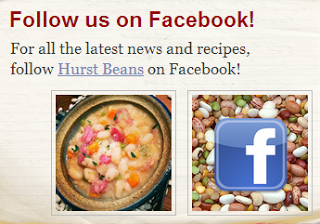 Make sure to follow Hurst Beans on Facebook! This may be a silly question, but should the sausage be cooked before putting it in the crock pot? yes! The smoked sausage at the grocery store is usually already cooked! My husband actually just bought these beans! I bet he'd love this recipe, too. 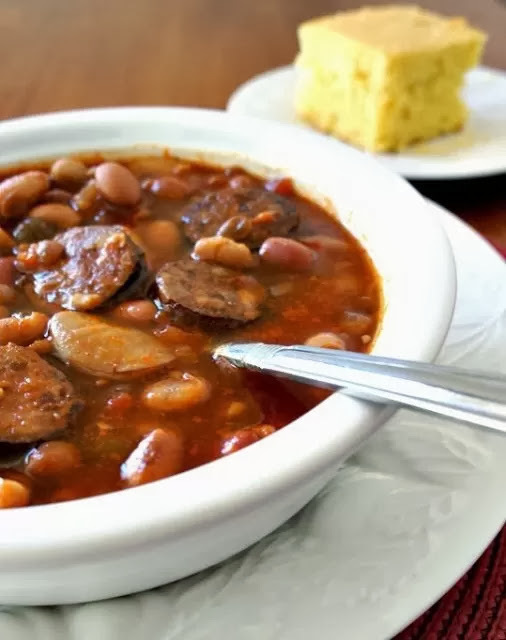 My family loves this 15 bean soup better than red beans and rice. I friend called me for the recipe last week. I LOVE LOVE LOVE LOVE LOVE soup! I can eat it ANY time of year. My favorite is vegetable, or chili and I really like chicken tortilla soup as well! I would love to win! This looks yummy! Love bean soup! Squeaking in under the deadline for the giveaway! This looks so warm and yummy! YUM!! I've made similar before & loved it! Can't wait to try your version! Chicken noodle is one of my favorites. My favorite soup is Taco Soup! My favorite soup is chicken tortilla soup! All I have to say is Yum! Thank you for providing major meal inspiration. I love making (and eating) 15-bean soup with sausage and ham hocks. Yum! My favorite soup is baked potato soup. I love tomato basil Parmesan soup! Tomato soup is my favorite. I love an old-fashioned split pea and barley soup, made with a ham bone. And here's hoping I win – I live in Hurst, texas, so maybe this is an omen of something good to come. I have LOTS of favorites… but I will narrow it down to my top 2… Taco soup & Tomato basil!! Ack! How to pick a favorite soup? 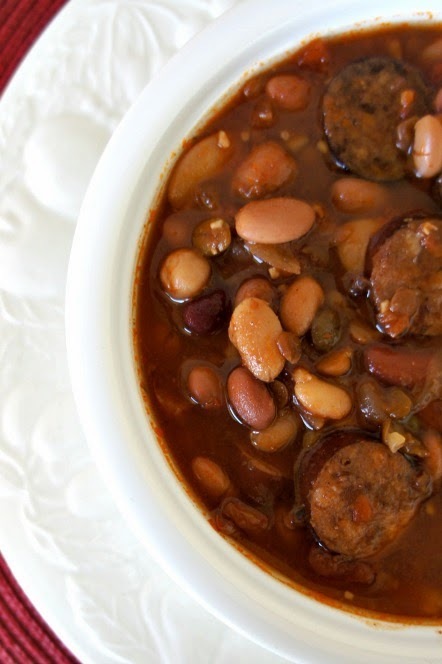 I have so many…and I do love bean and sausage soups so I will be trying this recipe. Taco soup is always good. And clam chowder…or chowder of any kind. Monday morning, we start the process of removing my teeth from the damage done to my bones from cigarette smoking. For more than. Ten weeks, i will be living on soup. Any recipe, whole food, small bits, just soup and juice. 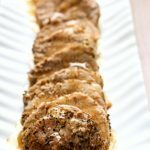 I am looking for as many recipes as I canfind. This one looks good! This will be perfect for dinner. Nice cool Autumn Day…yummy! This sounds like a soup my family will love. And so will my budget! This soup looks good! I recently tried one of your tomato soups and it was delicious! Oxtail soup my mother used to make every winter. LOVE it. My family loves soup! Pretty much any kind. This looks like a winner, I will be making this soon!! I love tomato soup, clam chowder, and many other kinds. It's hard to pick a favorite! This looks really good! My favorite soup is potato soup! I love Butternut Squash Soup. I will have to try this recipe soon. I really wanna try that recipe. I love Chicken Tortilla Soup! And French Onion! And Golden Tomato! I love French Onion Soup. Thanks for the chance to enter. Our favorite is my slow cooker beef vegetable. But, we love to have soups any night of the week and I would love to try this one! Sounds delicious!!! My favorite soup is always Chicken Noodle. But a great bean soup is hard to resist! My favorite soup has always been 15-bean. 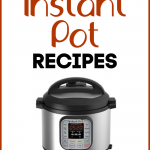 So excited to see a slow cooker recipe for it! Thanks! I am ab to prepare the barley and beans recipe so it will cook in the morning and be ready for lunch tomorrow. And I love bean soup! And its a way that my kids will eat beans too! I can't wait to try it in the crockpot! My husband's turkey stew. Or my mom's hot dog bean soup. Beef stew is my favorite and chili is a close second. Love using these beans! My mum would make the chili all the time and I adored picking out all the legumes. So hard to pick cause I love so many soups. 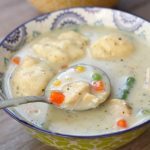 Probably homemade chicken and dumplings soup. 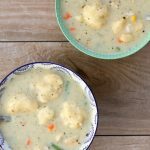 My favorite soup is potato but would love to try this recipe. I make something like this with black eyed peas. Was heading to store so think I will change it up with the 15 bean soup instead. 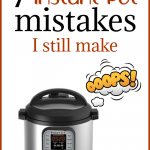 I make up a huge cropot full and freeze in individual servings. So good. My favorite soups is homemade chicken noodle but bean soups is a close second. Creamy chicken noodle soup. Love loaded baked potato and broccoli cheese but cant make them because my daughter is allergic to the cheese and cream. My favorite soup is white bean & ham! MY FAVORITE SOUP IS MATZO BALL! This looks really good. Love the smokeiness. Looking forward to making it. A nice alternative to chili during the witner.